Kitchen Drama. Does anyone know what I’m talking about? You have a recipe all planned out and for some reason, it doesn’t go your way. I take it all in stride now. You have to adapt, use your baking skills and move on with confidence that you can pull it off and everything will be okay. If it doesn’t turn out, that’s okay too because every baking adventure is a learning experience, good or bad! 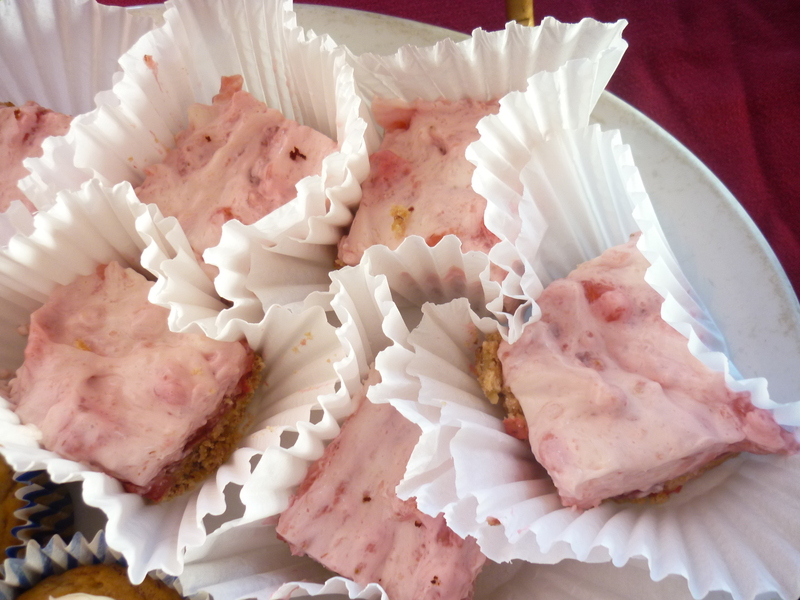 Take these strawberry bars, for example. The original recipe called for fresh raspberries (original recipe found here, but I could not use them because my raspberries that I bought the day before were rotten (I’m still mad at that store, lol!) I was feeling the pressure because I had a lot of other desserts to make that night, and there was no time to jump in the car and exchange them. Thank God I had fresh strawberries in my fridge and I just substituted this ingredient and made a few other changes. More drama: It was also a new, untested recipe for me. I was taking my chances, but really I had no choice. In the end, it turned out fabulous and I got rave reviews! I can confidently add this recipe to my “tried and true” Diabetic Desserts File. are you ready for some drama? 1. To prepare crust: Preheat oven to 400 degrees F. Coat an 8-inch square baking pan with cooking spray. 2. Food processor method: Place flour, pecans, Splenda, and salt in a food processor; process until the nuts are finely ground. Add butter one piece at a time, pulsing once or twice after each addition, until incorporated. Add ice water and vanilla and pulse just until the dough starts to come together. Transfer to prepared pan. Press evenly and firmly into the pan to form a bottom crust. Blender method: If you do not have a food processor, use a blender (like I did): Place flour, pecans, Splenda and salt into a blender. Mix until nuts are finely ground. Transfer to a medium bowl. Using a pastry cutter or clean washed hands, add butter and mix until it forms a coarse meal consistency. Add ice water and vanilla and mix until dough starts to come together. Transfer to the prepared pan. Press firmly into the pan to form a bottom crust). 3. Bake the crust until it looks set, but not browned, about 15 minutes. Let cool on a wire rack. 4. To prepare the strawberry filling: Wash strawberries. Smash strawberries in a medium bowl with a potato masher. Transfer to a medium saucepan and to this add gelatin packet, 2 tbsp. water, and 1/4 cup Splenda Blend. Stir. Cook over medium heat until bubbling. 6. Fill a large bowl with ice water. Pour the strawberry mixture into a medium bowl and set it in the bowl of ice water. Refrigerate, stirring occasionally with a rubber spatula, until the mixture thickens to the consistency of loose jam and is beginning to set around the edges, about 30 minutes. 7. Meanwhile, beat the cream cheese, milk, and confectioners’ sugar in a large bowl with an electric mixture until smooth. Add strawberry mixture and mix until well incorporated. Dollop then spread over cooled crust. Refrigerate until the bars are completely set, about 3 hours. Cut into 16 bars. Serve in a muffin size paper cup. Something wonderful is happening around here. There’s a new baker in the house! My husband, Mi Amor. What has he baked, you ask? So far: Chocolate chip cookies, brownie mixes, and cakes from a mix. Pretty awesome, isn’t it? Humble beginnings with cake mixes and cookies – that’s how it starts, remember? Never would I have imagined that in our middle-aged years (yes, I finally said it…), my husband would be baking, and sometimes right along side me. Like the other night when I was baking this classic apple pie, and he was baking chocolate chip cookies (his second time in one week!). Yes, life is BEAUTIFUL. I think part of the reason why I love to bake is the discovery. I normally don’t make apple pie because frankly I think it’s too labor intensive – peeling the apples, making the crust, waiting 60 minutes for it to bake! But, I had a special request for an apple pie from my mother-in-law. I will do anything for my mother-in-law. 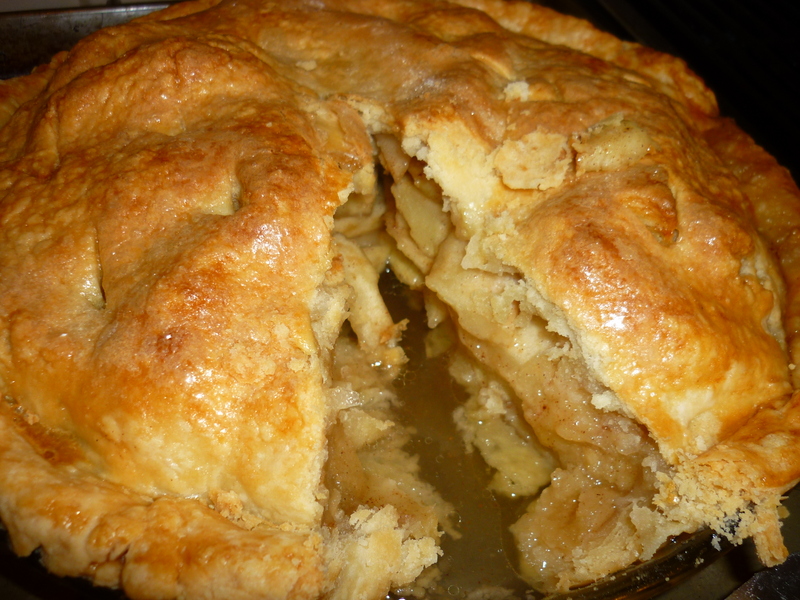 Quickly I pored through my cookbooks and settled for Martha Stewart’s Classic Apple Pie. I trust Martha. And, I trust my instincts – 2 sticks of butter means a great pie crust. But, being that it’s been a while since I baked my last apple pie and the fact that it’s for my mother-in-law, I was still a little nervous about how it would turn out. Well, thank God the apple pie turned out – She loved it. Life is BEAUTIFUL. 1/4 cup ice water, more if needed. In a large bowl, combine flour and salt. Then cut in the butter with a pastry blender (I also used my clean, washed hands). Add the ice water a little bit at a time. Test by squeezing a small amount of the dough together. If it is still too crumbly, add a bit more water, 1 tablespoon at a time. Turn out the dough onto a clean work surface. Divide in half, place one half disk in a piece of plastic wrap. Cool in the refrigerator. On a lightly floured surface, roll out the other half into a 12-inch round. With a dry pastry brush, sweep off the excess flour; fit dough into a 9-inch glass pie plate, pressing it into the edges. Trim to a 1/2 inch thick overhang all around. Place into the refrigerator. At this point, you have one dough disk chilling in the refrigerator, and the other disk rolled out and chilling in the pie plate. 3 pounds apples (I used Granny Smith) peeled, cored, and cut into 1/4 inch thick slices. DIRECTIONS: In a large bowl, toss together the peeled and sliced apples, lemon juice and granulated sugar, flour, cinnamon, nutmeg and salt. Arrange in the chilled pie shell. Dot with butter. On a lightly floured surface, roll out the remaining chilled dough disk into a 12-inch round. Brush the rim of the pie plate shell with an egg wash, then place the second piece of dough on top, and gently place over the apples (I actually forgot to do this step and I was still able to seal the 2 pie doughs). Gently press the top and bottom pieces of dough together to seal. Using kitchen scissors, trim the top piece of dough into a 1 inch overhang all around. (I didn’t have an overhang of dough, but I kept pressing and tucking). Tuck dough under, and crimp edge as desired. 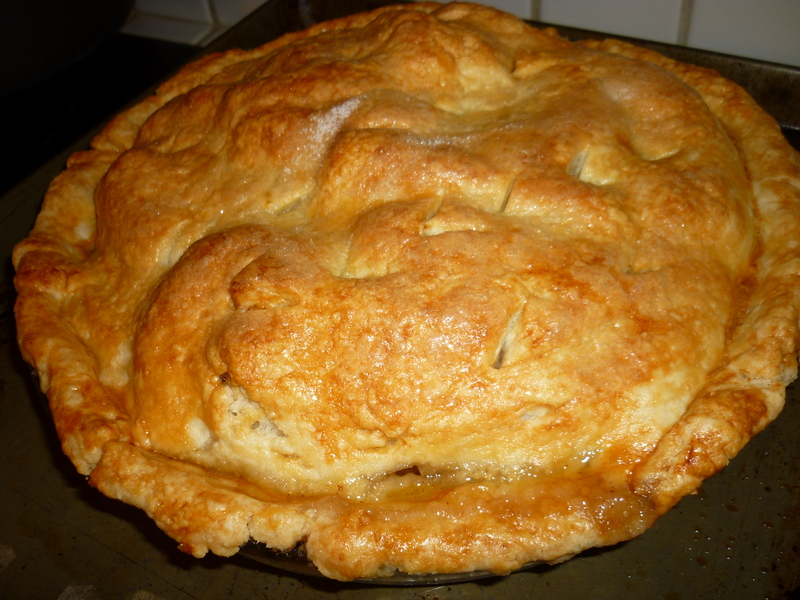 Brush the entire surface of the pie with egg wash, and sprinkle generously with sanding sugar. Cut 3 vents in the top to allow steam to escape. Preheat oven to 400 degrees F, with the rack in the lower third of oven. Place pie on a parchment lined baking sheet. Bake until the crust begins to turn golden, about 20 minutes. Reduce oven temperature to 350 degrees F. Continue baking, rotating sheet halfway through, until the crust is a deep golden brown and the juice are bubbling and have thickened, 40-50 minutes more. Transfer pie to a wire rack to cool completely.